This apartment is situated in one of the best locations in Los Cristianos.This luxurious apartment has recently been renovated and has two bedrooms and one bathroom. One bedroom has a double bed and the other two singles making it ideal accommodation for a family . It is an ideal holiday location for a maximum of four people. It is on the beach frontline on the outskirts of Los Cristianos and has a balcony overlooking the pool area and it has a sea view . A small sandy beach with its own bar/ cafe is just 100 mtrs away and a larger sandy beach , in a lovely bay , also with its own bar / cafe is just 200mtrs away . The apartment has satellite TV with programmes in various languages,free fibre- optic high speed broadband , DVDplayer , microwave , oven , toaster, washing machine , an iron and a fridge . The complex has two swimming pools , one for the kids and the other for adults , plus its own enclosed gated car park . Nearby there are a number of excellent bars and restaurants plus two supermarkets , one of which is Iceland .The apartment is on the first floor of the complex so it is secure . Access is via a slightly sloping ramp and there are no steps . There is a lift for access to the carpark and pool area below . This makes it ideal for elderly people and people with limited mobility . An electric mobility scooter can be parked at the front door . 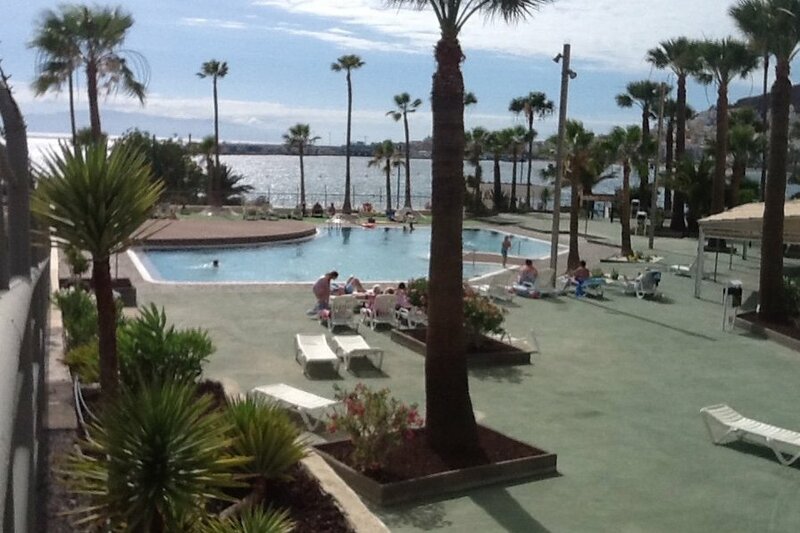 There is a taxi rank approximately 300 mtrs away and there is direct access onto the seafront promenade which extends to Las Americas and beyond . The Las Americas golf club is approximately 3 km away .